I am in hysterics, just heard on the radio from a woman who rang in to report funny things kids say, her example was “Mum, my bum just swallowed a marble”!! Our last night at Karte was shared with another couple from Victoria, towing – you guessed it – a Kimberley Karavan!! They had been to the Flinders Ranges and were returning to Melbourne. We hope they found the orchids after drawing a mud map for directions!! We crossed the Murray River at Cadel, and the Ferryman said it was 1.4 metres higher than usual. It looked spectacular. The family of a longtime friend of Russ’s brother lived at Cadell’s Reach near Lindsay Island, we wonder if is the same Cadel? 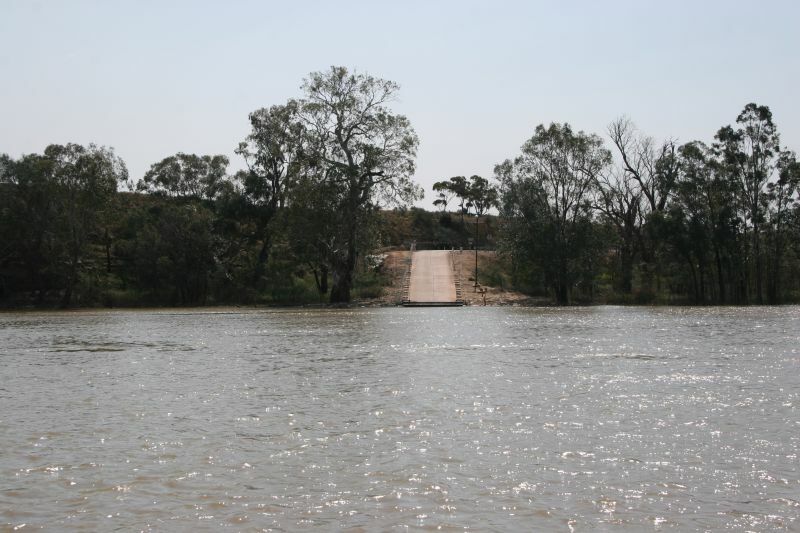 Burra is a mid-north town, situated approximately 150km north of Adelaide. It was once one of Australia’s earliest and most significant historic copper mining towns. 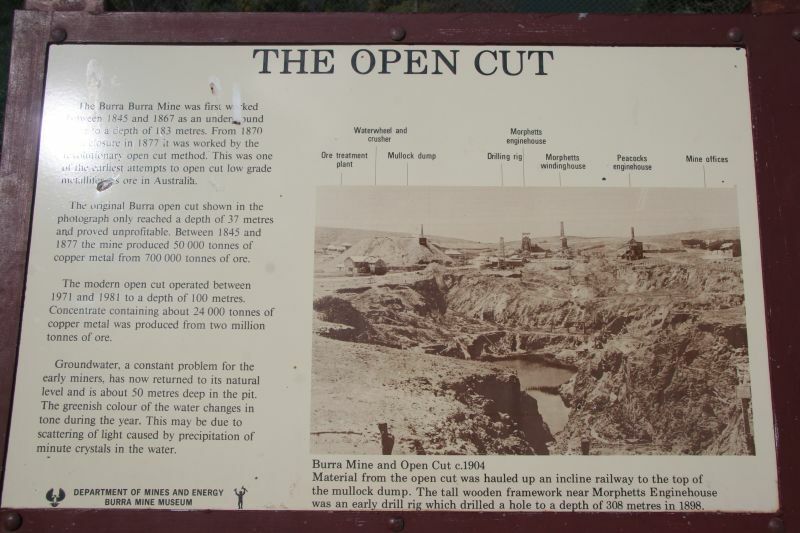 In 1845, Thomas Pickett (a shepherd) found samples of green copper ore near Burra Creek. 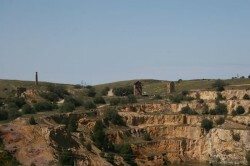 The South Australian Mining Association, a company of Adelaide investors, bought the land and commenced mining the following September. The mine was for fifteen years and was one of the largest in the world. Its shareholders received 800,000 pounds in dividends and Pickett received 10 pounds as a reward for his discovery! By 1850 Burra, with a population of around 5,000, was the largest inland settlement in Australia. Until the mid 1860s, Burra remained the largest town in South Australia apart from Adelaide. Unfortunately, we have been confined to the caravan most of the time, with the shocking weather. We have had 100+km gales, rain, freezing temperatures. We booked in until Thursday night, but it is a long weekend and the start of the school holidays, and we haven’t been able to get into Clare until Monday. This morning, we had the thought of checking at reception to see if there had been any cancellations due to the weather and there were. We have to pack up and move from this site, but that would be better than being without power for another three nights. We must be getting soft! This morning, we went out for breakfast, then went on a tourist drive around Burra and enjoyed seeing the characteristic stone houses, surrounded by rock fences, still standing, without mortar. 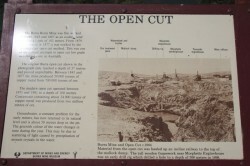 We went up to the mine site, but couldn’t get out of the car because of the weather, except to take a couple of photos. part of the Richard Nicholas family. He was a tin miner from St Just in Cornwall and Cornish tin miners were recruited to work in Australian mines. He is supposed to have stayed four years in SA from approx.1849-1853. They travelled with Richard’s brother, Michael (the Aspro Nicholas’s grandfather) via SA to Victoria. We had a delicious Cornish pasty yesterday in remembrance!! We may have to do it again today! !